Looking for some indoor family fun during these shorter days of winter? 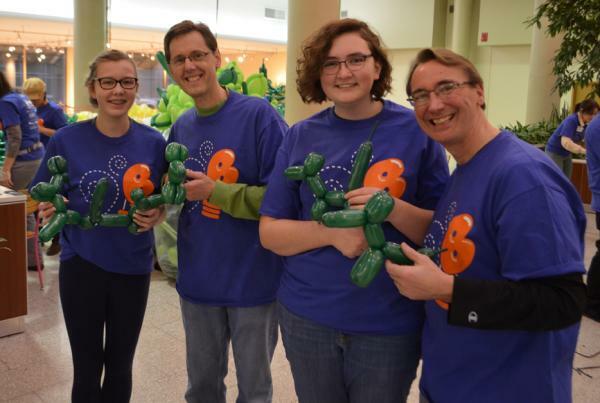 Rochester-area artists Larry Moss and Kelly Cheatle of Airigami (“the fine art of folding air”) will create their latest, immense 5-story art installation in downtown Rochester, New York entirely out of balloons. Airigami’s past whimsical sculptures included Jack and the Beanstalk (2014) and an Undersea Adventure (2015). This year’s Balloon Adventure brings our region’s outdoor natural wonders indoors and takes visitors on a Journey on the Genesee River. “We are incredibly excited to recreate nature with balloons – the river, waterfalls, animals, plants – inside, in the middle of winter,” says Airigami Artistic Director and Founder Larry Moss. 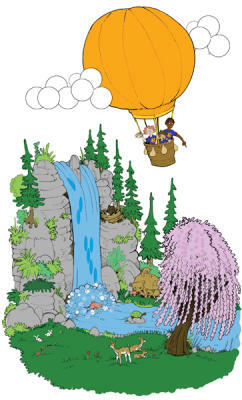 Airigami has partnered with two local institutions, the Seneca Park Zoo Society and YMCA of Greater Rochester, to bring Balloon Adventure: Journey on the Genesee to life. The Seneca Park Zoo has long sought to preserve our region’s wildlife and natural resources, and Balloon Adventure: Journey on the Genesee highlights the animals one might encounter during a stroll along the Genesee River. The Rochester area YMCA has many after-school programs particularly for underserved areas, and their new after-school YMCA programs will incorporate Seneca Park Zoo with STEM instruction developed with Airigami. In addition to the Balloon Adventure: Journey on the Genesee work of art itself, there’s a vibrant community spirit that pops up around the installation, and families can enjoy free, live entertainment including storytellers, magicians, and local performing groups. 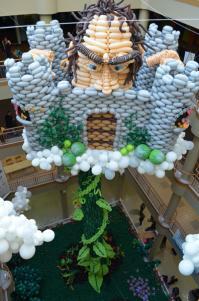 However, the star of the show is certainly the 40,000-plus balloons used to create this fanciful work of art. The 5-story art-installation needs to be seen in person to be fully appreciated. For 2014’s The VERY Tall Tale of Jack and his Beanstalk, Airigami achieved an amazing level of storytelling-ability to capture Jack’s perilous climb and gigantic confrontation. 2015’s Amazing Air-Filled Undersea Adventure, created a sailing frigate, deep sea monster, and a hapless crew all out of inflated and artfully arranged balloons. 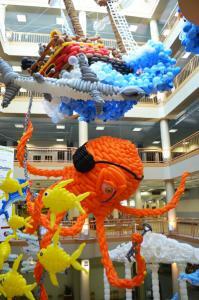 The five-story, 50-foot tall Balloon Adventure: Journey on the Genesee will be made from more than 40,000 compostable balloons in Rochester’s historic Sibley Building atrium (250 E. Main St., 14604). Construction begins on Monday, January 25 by a crew of approximately 60 artists and volunteers from all over the country and as far away as the Netherlands. The piece officially opens at 10:30 a.m. on Friday, January 29. Both the build and the finished installation will be on display to the public free of charge through Sunday, February 7 (9:30 a.m. – 6:30 p.m. daily), when the installation will be deflated during its traditional Popping Party. Larry Moss and his international crew of artists invited my 15 year old daughter Evie and I to the Balloon Adventure construction site for an inside look at this year’s creation. 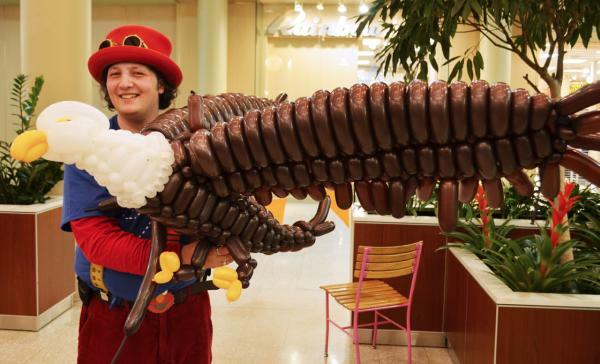 Balloon artist Andrew Weaver (Air Weaver Balloons and Magic) of Sunbury, PA took us under his wing, and taught us the basics of balloon twisting – the balloon dog. We felt a huge sense of accomplishment tying our first balloon dogs and tossing them on the “dog pile” to become green loops of natural grass for Airigami’s Journey on the Genesee. Andrew pointed out the various aspects of the large-scale project including incredibly elaborate balloon animals, a waterfall, and weeping willow. One is quickly impressed with the skill and accomplishment of the artists, but also the scientific precision of the piece. The “inflatinator” fills each balloon with the perfect amount of air to make the delicate curves and shapes of the artwork. Deborah Fellman taught us a “distortion technique” used to make a field of fungi. 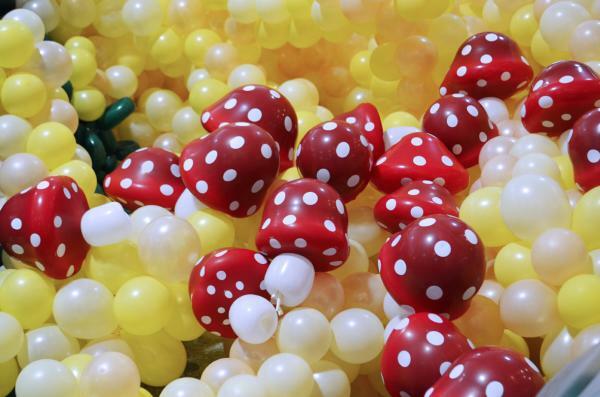 Four balloons created each individual mushroom, looped and inflated inside the red & white polka dotted cap, in a maneuver my clumsy fingers could not master. I’ve always been impressed with the Balloon Manor displays built by Airigami to brighten up our Rochester winters, but even more so after my meager attempt at the “art of the twist.” I asked Evie what she thought of our experience, “I’m glad I turned off my video game to come,” she replied. 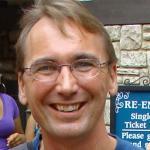 And for the Dad of a teen, there’s not much higher praise than that. Airigami’s Journey on the Genesee is unveiled to the public on Friday, January 29th, and remains on display entirely free of charge until Sunday, February 7.